Live Your Dream Life NOW! Kirsten Britt is an academic innovator with direct experience as a nonprofit professional working in urban academic settings with varied student learners. Kirsten has over ten years of extensive experience in designing and instructing academic programming and training for a diverse population of individuals. She founded Inspire Me 2 Change (IM2C), a mentoring, coaching and small business consulting company which specializes in group mentoring workshops for all ages, life and career coaching and small business and church consulting. She serves as VP for a non-profit Life Outside the Streets (L.O.T.S.) They use performing arts, entertainment, recreation and education to influence success in the classroom. Kirsten is a founding partner of Living Our Vision (L.O.V). This organization was created to supply answers to the city's homeless and adjudicated youth problem. By providing housing and programming L.O.V hopes to help these children live out their vision. Audra Anusionwu is Founder and CEO of BeautiFitStrong. A Philadelphia native and health advocate, Audra has worked in the behavioral health field for more than 15 years. In 2002 Audra began amateur boxing where she started her personal wellness journey. She had become overweight and unhappy with herself and boxing gave her the confidence and strength to fight for her health. The journey was tumultuous and she began to pack on pounds again after trying various diets and lifestyle changes. It wasn’t until October of 2013 when she was unable to post pics of herself that she realized that her weight was getting out of control. In October 2013 Audra decided to compete in a figure competition, a level of female bodybuilding with a feminine look. Competing gave Audra the accountability she needed to stay committed to the gym and stick to a strict diet. After only 6 months of training Audra completely transformed her physique. In her second competition she placed 1st place in Masters Figure and 2nd place in Open Figure. In 2014 Audra developed a love for lifting weights and decided to attend the National Personal Training Institute in Philadelphia to become a Certified Personal Trainer. In addition to completing her certification Audra began training other woman to help them feel as empowered as she’d felt about changing her body. She began the campaign for BeautiFitStrong (BFS). BFS is a physical fitness and nutritional education business. In addition, its a lifestyle brand for woman and girls that focuses on fitness, nutrition and overall wellness. BFS uses social media outlets and community forums to share information about health and wellness. It encourages and empowers women to push themselves to the limit and step outside of their comfort zone in to order to have a more healthy, fit, and balanced life. Adrean Turner, “The Career Fulfillment Expert”, is a Certified Career Coach, Business Consultant and Professional Development Trainer. As owner of Turner Coaching, Training and Consulting, LLC, she uses 23 years of experience in Management, Marketing, Operations, Teaching and Training to motivate and support clients to excel in pursuit of goals to achieve success. Adrean hosts the daily podcast “F.I.T.® Tips for Success”, which broadcasts on a local Philadelphia radio station and international channels. Adrean is a Master Coach, with the Muse®, Trainer for the TriCounty Community Network and Instructor for Chambers throughout PA. Her passion for teaching has led to a 7-year career in academia. And she currently serves as Adjunct Professor of Economics at Alvernia University. Adrean is a highly regarded public speaker for Women’s groups, businesses and non-profit organizations. 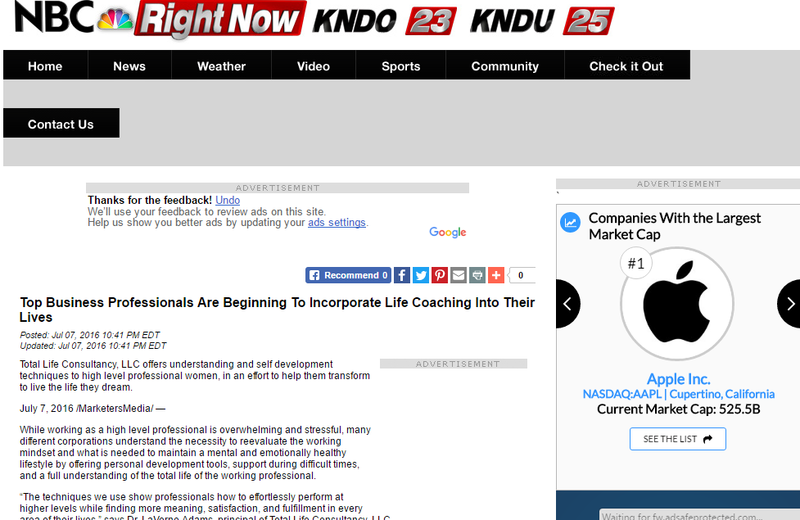 Adrean received coaching certifications from the Life Purpose Institute, LLC. She holds a B.S. in Economics, a Master's degree in Management and an MBA, all from the Pennsylvania State University. Dr. Williams has over 20 years of experience working comprehensively in the field of mental health. In various capacities across the system, Dr. Williams has been an innovative contributor and guiding force as she rose through the behavioral health ranks from Academic Researcher and Trauma-Based Clinician to University Faculty Member, Program and Organizational Consultant and, most recently, CEO of Germantown Psychological Associates, a community based, clinical services provider. This show promises to be fun, and exhilarating show and packed with memorable life changing tools and techniques and dynamic guests who are living proof that total life transformation is possible. If you have a Total Life Transformation inspiring story to share, please let me know! Casting calls are being held for guests to be on my new Total Life Transformation TV show! Email me your life-altering story at DrLaVerneAdams@gmail.com. Please ask about our sponsorship packages to be the featured sponsor on the show. Get ready for Total Life Transformation TV with my guest, emotional transformation expert, Dr. Angela Roman Clack who is a psychologist and licensed psychotherapist at Clack Associates, LLC a private practice outpatient counseling agency in Southern New Jersey. She has been working in the mental health field for more 25 years. I want to thank you so much for allowing me and my husband the experience we had last night at the destiny celebration as I sat there with tears rolling down my face. It opened up my thinking and now I have to do what I always felt I wanted to do… you can’t imagine how many people you have touched and are going to touch. I just wanted to let you know You are a God send! Dear Dr. LaVerne Adams, I have been meaning to tell you how your event inspired my life! I was driving home from school when I heard you speak about the destiny event on the radio.I felt like it was part of my destiny ! I experienced a spiritual awakening.God is doing something and I just want to thank you for being a vessel.